Each year, before Lent begins, we celebrate the Burning of the Palms - a time of rejoicing, much like Mardi Gras. 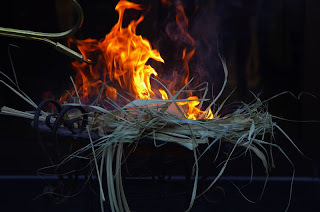 At this celebration we burn the palm leaves from the previous year's Palm Sunday and sing songs of alleluia. Join us for king cake, beer, wine, soda, fire, and alleluia! @ 7:00pm, on Grace's Patio.